Accept your fate or be destroyed by it: To a gladiator In the depths of depraved servitude, this choice is all that remains before stepping onto the sands of the great arena. But what of their masters? The ones pulling the strings. 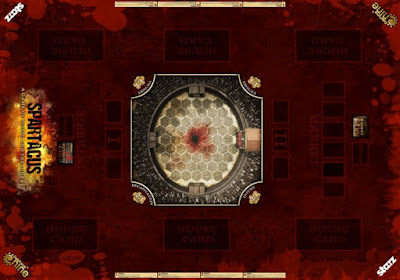 For every Dominus that seeks to elevate the position of their house and ludus, there is a rival scheming to do the same - through blood and treachery. These dynamics of power are what made the Starz Tv series Spartacus: Blood and Sand so devilishly intriguing, and what set the wheels in motion for one of the bloodiest slave uprisings in world history. Gale Force Nine Games has partnered with Starz to capture the essence of the acclaimed TV series, and harness it into a purely outrageous experience. Up to four players are provided up with the clever mechanics to profit from the victories of their greatest champions - while betraying their closest allies in the relentless climb for status. Spartacus: A Game of Blood and Treachery truly embodies its namesake. Each exciting turn consists of three phases designed to immerse players in the tense lifestyle of running an ancient ludus in a corrupt city: The first phase is the aptly titled Intrigue Phase, during which players draw cards from the Intrigue Deck. This deck contains different schemes, reactions, and guards, that can be played against other Houses to rob them of gold and status - or to protect your own fortunes depending on the amount of influence you wield. These cards can also be used to help other players if an alliance needs to be forged against the strongest house... But these should always be temporary at best. The Intrigue Cards are an especially delightful tribute to the various phrases and plots hurled by Batiatus at his most memorable rivals from the TV series: Solonious, Tullius, and Glaber (All together the 4 playable houses). 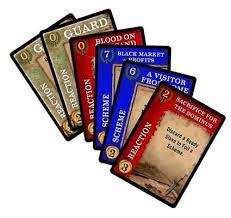 The cards impact so many different game elements in brilliant ways that playing them at just the right time is an art form pivotal to your overall strategy. After intrigue has been showered onto thine enemies, the next step is the Market Phase. In the Capua Marketplace gold speaks louder than words ever could. 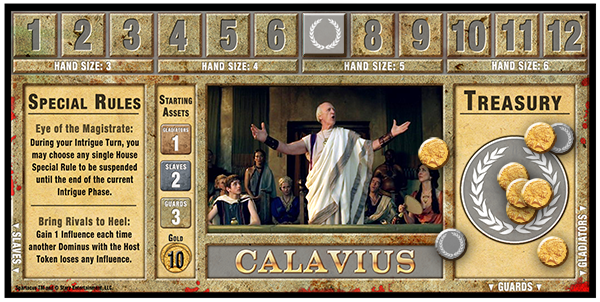 Players bid a closed fist of gold from their treasuries on weapons, armor, slaves, and gladiators - including many of the famous titans from the show - each with their own strengths and contextual abilities. Also up for auction is the great honour of hosting the games the following turn. Hosting automatically awards one point of influence to the highest bidder when their games are held - getting them that much closer to victory. Finally comes the Arena Phase. This is where the player hosting the games for that turn invites two houses to take to the sands for the glory of the Republic! Wagers can be placed on the outcome of the match, and as the riveting excitement of betting on - and even just watching - the epic arena matches unfolds, your best fighter (and the lifeblood of your ludus) may fall to the unlucky roll of a few dice. Refusing an invite costs influence so it is unwise to do so. Even if a you are without usable gladiators, you must battle with terrified slaves in their stead. 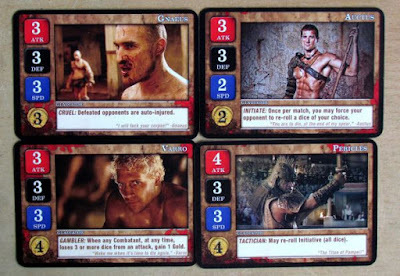 A gladiator's attack, defence, and speed are determined by stats on their corresponding card. These stats allow the specified number of corresponding combat dice to be rolled - and grid squares to be moved - during battle. 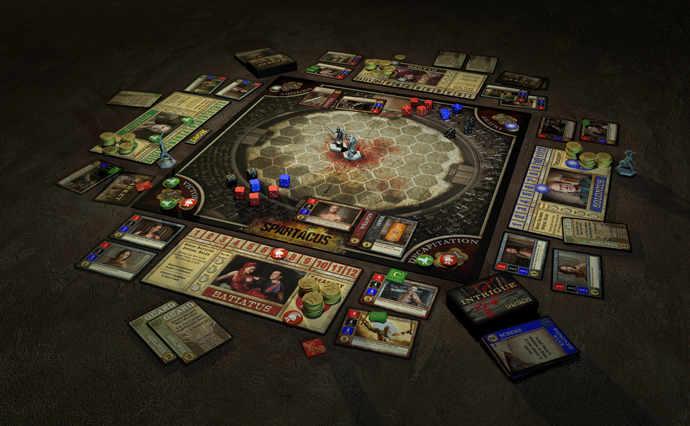 A dice is lost every time a player takes a hit, and the match is over when any set of combat dice deplete to zero. In a moment befitting of an Roman Emperor, the host can then give the infamous thumbs up or thumbs down to determine the fate of the defeated; strategic if a rival house has been brought to their knees. When to spend gold on champions. How much to gamble on the outcome of a match (with the potential for huge payouts for the most vigilant Dominus). Who to align with to secure position, how to use the character-driven special abilities of each ludus. When to unleash the intrigue that will burn a rival house to the ground - or raise your own up from - the ashes of fate. 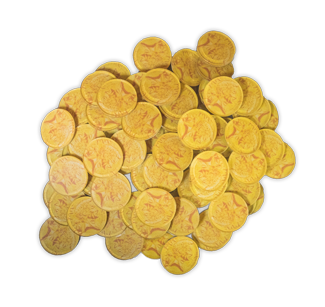 In true Spartacus form, careful planning must be embraced to ensure enough gold is secured to buy and bribe your way to the top, enough skills are present in your warriors' arsenals to let them survive and thrive on the sands, and enough status is commanded to outwit your adversaries - and allies - into a state of total ruin. 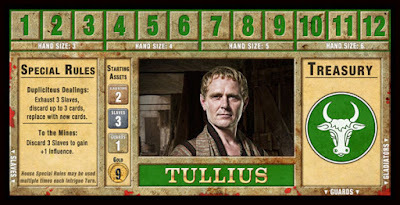 With the houses of Varinius and Calavius recently added to the fray in expansions, the gods of the arena stand ready to claim their place in the echelons of legend. 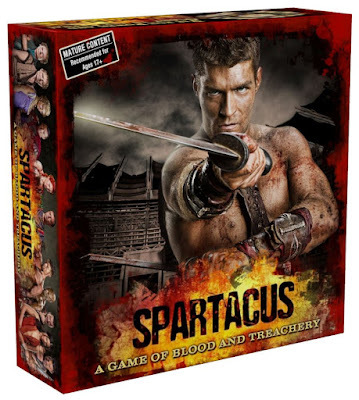 To say Spartacus: A Game of Blood and Treachery is entertaining is an understatement. To say it makes the player feel exactly like a rising Domnius prior to the outbreak of a massive slave rebellion would be more accurate. After all the intrigue and treachery is thwarted or succumbed to, there remains but one path to absolute victory: kill them all!